WASHINGTON, DC – Over two million visitors come to the Smithsonian Institution’s National Museum of American History every year to view pieces of American culture, from the original Star Spangled Banner, to iconic McDonald’s signs, to a pair of Mohammed Ali’s boxing gloves. It is pure and simple, one of the most concentrated celebrations anywhere of the American spirit and creative innovation. For one night in July, not all of that famed “Yankee Ingenuity” was on display in the museum’s exhibits. Eric Hertsch of John Farr Lighting Design also exhibited some impressive resourcefulness in the museum, as he overcame a limited power supply and tight schedule to transform sections of the building into a sparkling red, white and blue color scape with a rig made up entirely of CHAUVET Professional and CHAUVET DJ fixtures. As soon as visitors entered this private donor event, from the National Mall, they were greeted by a stunning visual of the Abstract Flag. An impressive sculpture made up of mirrored polycarbonate ribbons, the flag reflected brilliant blue hues created by the WELL Fit uplights. Hertsch positioned 36 of the battery powered RGBA fixtures around the flag and the surrounding wall. Adding to the patriotic atmosphere were the five-point stars projected throughout the room that housed the flag sculpture. Hertsch created these images with 16 Ovation E-910FC color mixing ellipsoidals that he positioned on truss towers in the mezzanine overlooking Flag Hall. 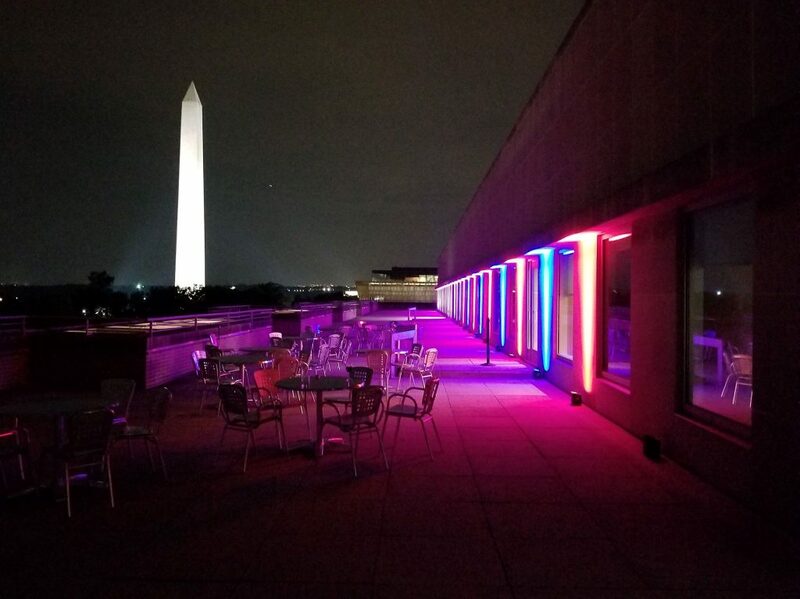 On the rooftop deck of the five-story building, the patriotic mood was set by red, white and blue wall washes created with 48 Freedom Par Quad-4 uplights. 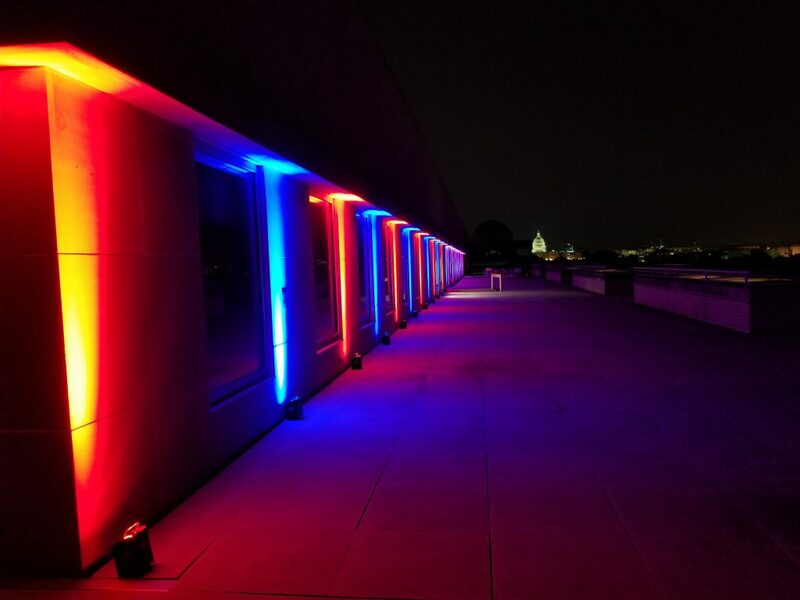 The building’s corridors were also adorned with the colors of the US flag courtesy of 48 Freedom Par Hex-4 units. In the end, Hertsch and the John Farr Design team were able to complete create a stunning design despite the challenges they faced. In true American fashion, they made it look easy.